When a piano silhouette sparkles through the first moments of “Demons,” you might think you’d reached for the wrong CD. The uptempo percussion sequence that immediately follows would only embolden this belief–that is, until John Gleason’s familiar rasp comes brimming into focus. 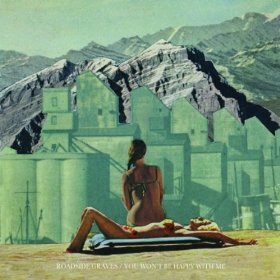 And, as with its opener, so it goes throughout much of the Roadside Graves EP You Won’t Be Happy With Me: new textures lightly tethered to the band’s previous work by familiar intonations and big crescendos, themselves fast becoming a trademark of the New Jersey-based explorers of Americana. Recorded in a cabin in upstate New York, you’re not finding the cold, spartan environs of a Bon Iver situation. By contrast, you hear something both big and less rustically conceived. In that way, even the group’s last long-player, My Son’s Home, might seem more instrumentally linked to something like a cabin. But lyrically, maybe some of those introspective qualities of the recording space come into play. Take “Liv Tyler,” which doesn’t seek to cheaply highlight pop-culture. Instead, it wonders on life in a world of questions; where we’re simply trying to carve out answers, only hoping they end up being the right ones. It takes a third-person relationship and makes it personal, internalizes it–a persistent quality throughout the record. This differs somewhat from previous Roadside Graves ruminations that seemed at times to come from afar. Holy christ, this song is amzaing. With every release these guys get better and better. Their live shows (I saw three of them at sxsw) are not to be missed. A fantastic EP! This EP kills. This incredible band just gets better. incredible.. whos the female vocals?? @clint: That’s Debra Disbrow, who certainly deserved mention here, and much credit for her contribution. Definitely one of the highlights of the EP. This band just keeps blowing my mind everytime they release something. Thanks for the heads up. Deb Disbrow has an AMAZING voice!!!!! She has since we were in high school…so glad she’s getting the recognition she deserves!